Boy Gorgeous sings ‘Yes We Can’ supporting Barack Obama. The song itself and the music have the positive sound and the power to touch. But the video is just too complicated EVEN to me. Ok, I tried hard to see symbolism in the animated video featuring David Bowie, John Waters-muse Divine, and Amy Winehouse. I am not sure if that makes any sense. Anyway Boy George is on his South American part of the tour. Today in Santiago, Chile, tomorrow in Quito, Ecuador. Following the 16th in Caracas, Venezuela, and Lima, Peru. And the last date is the 20th in San Jose, Costa Rica before doing his gigs in UK. 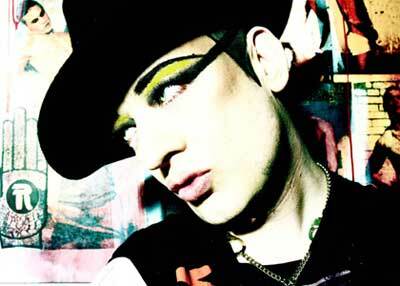 Unfortunately, or fortunately Boy George is denied to enter the United States. Read HERE why. Please tell me you are not someone who regularly does music reviews!!!!!????? First of all, the song has nothing to do with Obama. It is a song ABOUT Boy George………”Please forgive these crimes against myself”. And is also a song of inspiration…”Yes we can”…overcome our problems etc.. The clown is Boy George mocking himself sweeping the streets of New York. And Amy Winehouse is in the video because he respects her and hopes that she will say “Yes I Can” beat my addictions. Please do a little more research before you start putting people and their work down. And UNFORTUNATELY Boy George was denied a visa. Great song George!! !